Harvest and Halloween (Oct. Newsletter) — 1859 Cider Co.
As usual, October is buzzing with activity at 1859 Cider Co.! That's why we decided to put all the info in one place; to let folks know whats going on and hopefully making it easier to join in! Where can you find 1859 Cider participating in events beyond the taproom? One super groovy party full of food, drinks, fun, and a KILLER lineup of bands. It is FREE and ALL AGES! Located downtown in the beautiful, tree filled lot between Willamette Valley Bank and Ritter's. It's time to celebrate the abundance of apples and pears, and this event has so much to offer! Moving on to what's happening in the taproom! 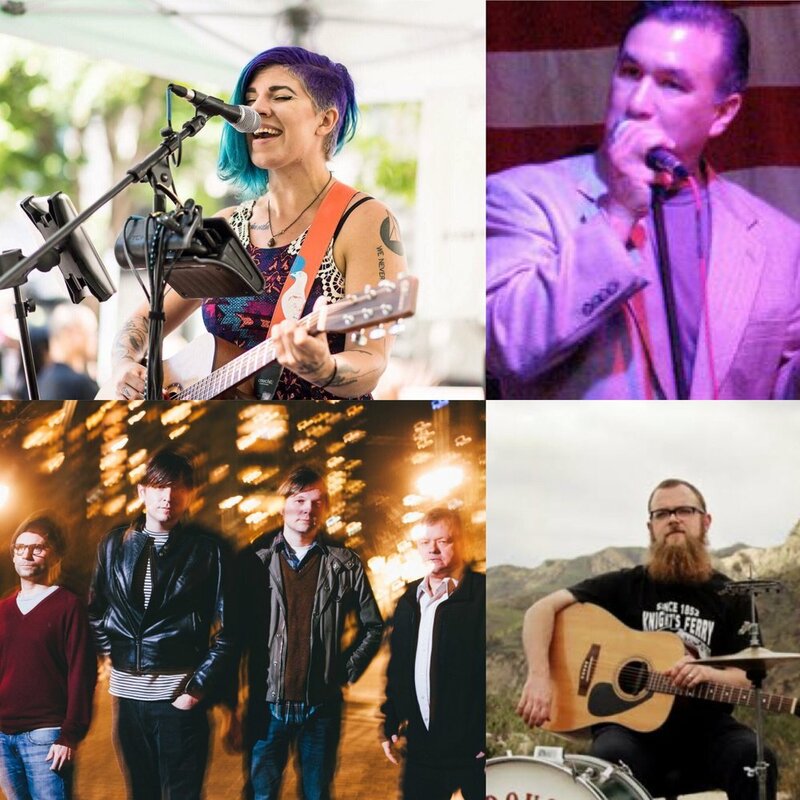 LIVE MUSIC: Give a listen to acts coming to 1859 by clicking on the band name below! HALLOWEEN WEEKEND : Free Music Friday and Saturday Nights from 8-10pm! 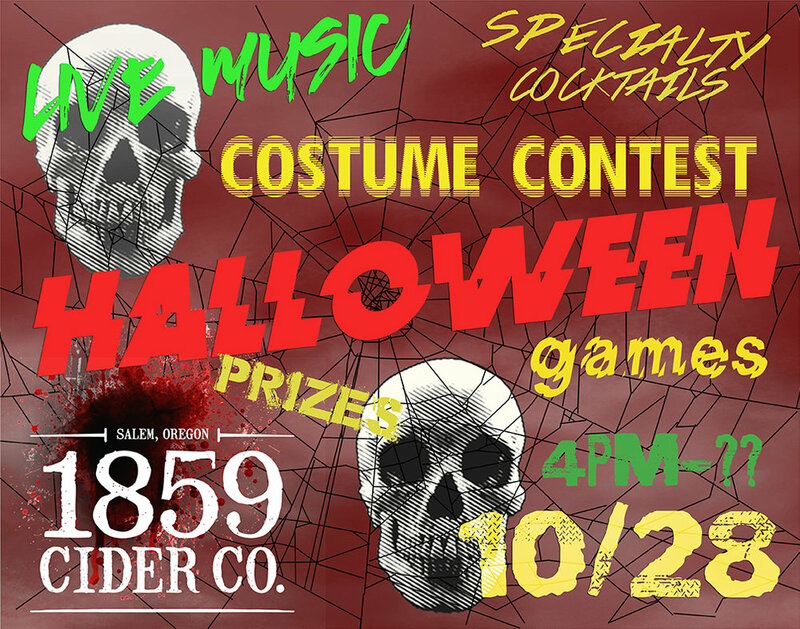 Make sure 1859 Cider Co is on the top of your list of stops for Halloween Weekend! On Saturday Oct. 28th, we are getting started early at 4:00pm. Show off those carving skills for a prize at 1859 Cider Co.! Don't forget your costume! We will be judging costumes starting at 6 pm and announcing our winner at 8 pm. Salsa Sundays- every week! 7-10pm $10 (cash) includes 45 min lesson and $5 drink ticket Click HERE for more details. ASL : American Sign Language- 5-6pm every week until Dec.! FREE! Come learn more colorful aspects of ASL. Click HERE for more details. Zumba Fitness: Sat. 10/8 1-2pm (Donation based class) - Pulling rhythms from reggaeton, merengue, salsa, cumbia, and other cultural sounds from around the world, this is a exciting workout for everyone! Amria is a blast, so come dance, sweat, and smile! Click HERE for more details. Herbal Remedies : Intro to the Benefits of Herbs Thu. 10/12 6:30-8:30pm - The wonderful Kathleen, from Avani Herbals, will be leading a workshop on using natural, organic herbs and their healing benefits. Growing, harvesting and drying will also be discussed. Click HERE for more details. Azūcar Social Hour : Thu. 10/ 19 6-9pm FREE- Azúcar Social Hour is an informal event for Latinos and non Latinos to meet with interesting people, trade business cards, and share ideas or announcements. Whether you are professional, business owner, artist or new in the city - we encourage you to join in. Click HERE for more details. Paint Night With Dena: 10/26 7-9pm- Painting "Soul Window" this month. This imagery is perfect to get you in the Halloween mood. So grab a friend and register HERE! Yoga and Cider: Sun 10/29 - Donation based class. This class is limited to 25 cider yogis, and always fills up. Please grab your spot in advance if you're interested in joining us. Click HERE to register. ALSO: Be on the look out for confirmed dates for October Paint Your Own Growler Night! As you can see, SO MANY reasons and ways to enjoy our events and CIDER!!! Keep your fall active at 1859 Cider Co. Newer Post#PICKCIDER for the Holidays! Older PostFood Truck + March Events!